Caesarean Section Birth | PELV-ICE LLC. Commonly known as a C-Section, a caesarean section is the method of delivery through abdominal surgery. Though less common than a vaginal birth, 1 in 3 women will have their baby this way through pre-planned election because of health or personal reasons, or during an unplanned emergency. Knowing the facts and risks of a c-section is important whether having one is the plan or not because things can change quickly during a delivery if a risk to the mother or baby is discovered. When creating a birth plan, it may be apparent to schedule a surgery in advance due to health concerns. Risks such as having a narrow pelvis, a heart condition, brain condition, or infection are main reasons why a c-section is considered. About 30% of women who have delivered a previous child through c-section have following children also by surgery due to the risk of uterine rupture during labor. There are unfortunately many unforeseen circumstances during delivery that could precipitate a c-section to mitigate risk to the mother or baby. Some of these events include: a stalled labor; drastic change in a baby’s heart rate; a baby is in a breech or transverse position; a mother is carrying multiples; placenta previa has occurred and the cervix is being blocked; a prolapsed umbilical cord had come through the cervix ahead of the baby; or a mechanical obstruction of the cervix such as a fibroid, fractured pelvis, or hydrocephalus. Any of the above situations can be scary, and to then by thrust into surgery unexpectedly only adds to the chaos. Some risks associated with having surgery include bleeding and hemorrhaging, and very rare cases of emergency hysterectomy, a longer hospital stay and recovery time, infection at the wound site and uterus, blood clots, and possible reactions to anesthesia. 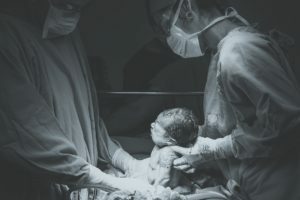 Because trauma is subjective to each person’s experience, some women feel that an emergency c-section is a traumatic birth, and can lead to increased postpartum depression. An initial follow up appointment with a medical care provider for all postpartum women is recommend by the American College of OB-GYNs no later than 3 weeks after delivery to check on physical and metal wellbeing of the mother, child, and support network. Like with any method of delivery, the reasons or method a woman choses is as unique as she is and should be respected. Having all information necessary to make an informed decision is an important first step. Read more about vaginal delivery or VBAC delivery.